......Preview from Best of Africa Edition. Scroll for readable size text. Click for full size pdf version of this spread. As Tanzania tourism booms, and officially becomes the #1 Economic Sector for the Country, it should come as no surprise that the number of women playing a dynamic role in their country's amazing progress has also grown dramatically. In the past decade the door has been wide open with opportunities for women to excel as professionals in Tanzania's rapidly expanding travel industry. And it all starts from the top. In May, 1998, as Tanzania hosted its first ATA Conference, it was a woman Minister of Natural Resources and Tourism (MNRT), Hon. Zakia Hamdani Meghji, who was at the helm. She was only the second woman to hold that post (the first was Hon. Gertrude Mongella 1985-88). Hon. Meghji, the longest serving Tourism Minister to date, was elected President of ATA's International Board of Directors in 2001 and led the organization until 2004. Now, a decade later, Tanzania's second ATA conference will also be hosted by yet another dynamic lady, the Hon. Shamsa S. Mwangunga, who was appointed as Minister of Natural Resources & Tourism in February, 2008. But this time, the Minister will also have a strong female team to support her, including the Ministry's second woman Permanent Secretary, Blandina S. J. Nyoni (the first was Rose Lugembe in 1996-98) and the second woman Director of Tourism, Maria Mmari (the first was the late Madina Muro, 1987-92). Zanzibar's tourism industry is also led by a woman, the Hon. Sameer Suluhu Hassan, Minister for Tourism, Trade and Investment. This year, 2008, Ms. Nyoni, announced that there were a record number of appointments of women by H.E. President Jakaya Mrisho Kikwete, to fill leadership positions in the Ministry of Natural Resources and Tourism. In the Tourism Division, this included Maria Mmari, Promoted to Director of Tourism; and Miriam Zacharia and Nebo M.J. Mwina, Assistant Directors in the Wildlife Department which plays a major role in conservation in a country that protects more than 25% of its land. 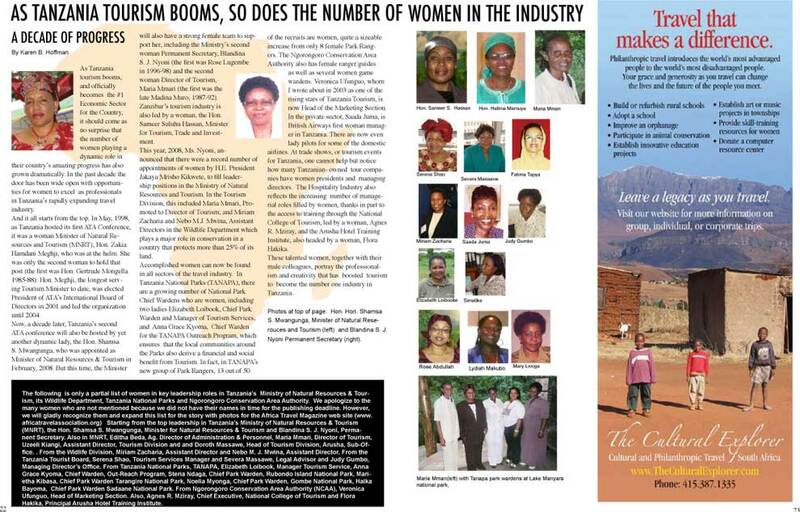 Accomplished women can now be found in all sectors of the travel industry. In Tanzania National Parks (TANAPA), there are a growing number of National Park Chief Wardens who are women, including two ladies Elizabeth Loibook, Chief Park Warden and Manager of Tourism Services, and Anna Grace Kyoma, Chief Warden for the TANAPA Outreach Program, which ensures that the local communities around the Parks also derive a financial and social benefit from Tourism. In fact, in TANAPA's new group of Park Rangers, 13 out of 50 of the recruits are women, quite a sizeable increase from only 8 female Park Rangers. The Ngorongoro Conservation Area Authority also has female ranger/guides as well as several women game wardens. Veronica Ufunguo, whom I wrote about in 2003 as one of the rising stars of Tanzania Tourism, is now Head of the Marketing Section. In the private sector, Saada Juma, is British Airways first woman manager in Tanzania. There are now even lady pilots for some of the domestic airlines. At trade shows, or tourism events for Tanzania, one cannot help but notice how many Tanzanian- owned tour companies have women presidents and managing directors. The Hospitality Industry also reflects the increasing number of managerial roles filled by women, thanks in part to the access to training through the National College of Tourism, led by a woman, Agnes R. Mziray, and the Arusha Hotel Training Institute, also headed by a woman, Flora Hakika. These talented women, together with their male colleagues, portray the professionalism and creativity that has boosted tourism to become the number one industry in Tanzania. Hon. Hon. Shamsa S. Mwangunga, Minister of Natural Reserouces and Tourism (left) and Blandina S. J. Nyoni Permanent Secretary (right). - in Tanzania's Ministry of Natural Resources & Tourism, its Wildlife Department, Tanzania National Parks and Ngorongoro Conservation Area Authority. We apologize to the many women who are not mentioned because we did not have their names in time for the publishing deadline. However, we will gladly recognize them and expand this list for the story with photos for the Africa Travel Magazine web site (www.africatravelassociation.org) Starting from the top leadership in Tanzania's Ministry of Natural Resources & Tourism (MNRT), the Hon. Shamsa S. Mwangunga, Minister for Natural Resources & Tourism and Blandina S. J. Nyoni, Permanent Secretary. Also in MNRT, Editha Beda, Ag. Director of Administration & Personnel, Maria Mmari, Director of Tourism, Uzeeli Kiangi, Assistant Director, Tourism Division and and Doroth Massawe, Head of Tourism Division, Arusha, Sub-Office. . From the Widlife Division, Miriam Zacharia, Assistant Director and Nebo M. J. Mwina, Assistant Director. From the Tanzania Tourist Board, Serena Shao, Tourism Services Manager and Severa Massawe, Legal Advisor and Judy Gumbo, Managing Director's Office. From Tanzania National Parks, TANAPA, Elizabeth Loibook, Manager Tourism Service, Anna Grace Kyoma, Chief Warden, Out-Reach Program, Steria Ndaga, Chief Park Warden, Rubondo Island National Park, Marietha Kibasa, Chief Park Warden Tarangire National Park, Noelia Myonga, Chief Park Warden, Gombe National Park, Haika Bayoma, Chief Park Warden Sadaane National Park. From Ngorongoro Conservation Area Authority (NCAA), Veronica Ufunguo, Head of Marketing Section. Also, Agnes R. Mziray, Chief Executive, National College of Tourism and Flora Hakika, Principal Arusha Hotel Training Institute.